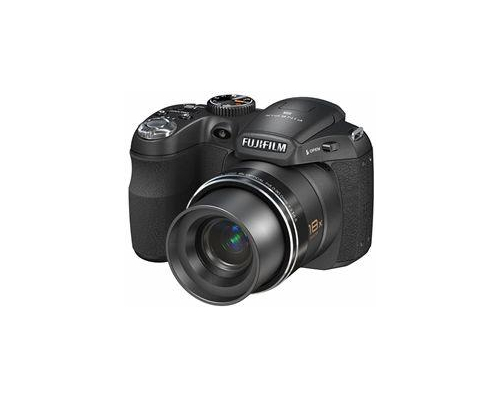 The Fujifilm FinePix S2550 is a budget megazoom camera with a body somewhere between a consumer point and shoot digicam and a dSLR often available at an easily accessible price point of under $200. The camera measures 4.3" by 2.9" by 3.2" and weighs 11.9 ounces without any accessories, batteries, or a memory card, making it consistent in size with other megazooms. The camera captures images using a 12.2 megapixel, 1/2.3" CCD. It stores images in its 23MB of internal memory, on SD, or on SDHC memory cards. It stores still images in the JPEG format, compressed via Exif v2.2, and captures movies using the AVI container format containing motion JPEG with sound, captured via the built-in microphone and recorded in WAVE and in mono. The camera captures images at many resolutions depending on the aspect ratio: at 4:3, it takes images at 4000 by 3000, 2816 by 2112, and 2048 by 1536. At 3:2, it captures images at 4000 by 2664, 2816 by 1864, and 2048 by 1360, and in 16:9 it captures images at 4000 by 2248, 2816 by 1584, and 1920 by 1080. When shooting video, it records at 320 by 240, 640 by 480, or 1280 by 720, all at 30 frames per second. The camera has an 18x optical zoom lens with a range between F3.1 (Wide) and F5.6 (Telephoto). The lens' vocal length is between f=5.0 and 90 mm, equivalent to a 35mm camera with a range between 28 and 504mm. The camera's digital zoom functions up to 6.3x and can scale up to 113.4x when combined with the optical zoom. The camera's aperture is F3.1 / F6.4 in Wide and F5.6 and F11 in Telephoto. The camera's focus distance, in Normal mode, is between 1.3' and infinity in Wide and 8.2' to infinity in Telephoto. In Macro, the camera's range is between .2' and 9.8' in Wide and 5.9' and 9.8' in Telephoto, and in Super Macro, the focus distance ranges between .1' and 3.3'. Its sensitivity can be set automatically or at ISO equivalents of 64, 100, 200, 400, 800, 1600, 3200, or 6400. The camera has an exposure control of TTL 256-zone metering with spot and multi control. The camera's exposure mode can be set to programmed auto exposure, shutter priority exposure, aperture priority auto exposure, and manual settings. The camera's dial has shooting modes configurable of SR AUTO, Auto, P, S, A, M, Custom, Movie, Panorama, SP, and SP can be set to subsettings of Portrait, Landscape, Sport, Night, Night (Tripod), Fireworks, Sunset, Snow, Natural Light, Natural Light & with Flash, Beach, Party, Flower, Text, Smile, and Zoom Braketing. The camera has a CCD-shift type image stabilizer. The camera's shutter speed is between 1/2000 and 1/4 of a second in auto mode and between 1/2000 of a second and 8 seconds in all other modes. The camera offers continuous shooting from 1.3 up to 8 frames per second. It offers both single and continuous autofocus. The camera's white balance has an automatic scene recognition system with a variety of presets: Fine, Shade, Fluorescent light (Daylight), Fluorescent light (Warm White), Fluorescent light (Cool White), Incandescent light and custom settings. The camera also has a self timer that can be set between 2 and 10 seconds. The camera's flash has an effective range in Normal mode of between 1.3' and 26.2' in Wide and between 8.2' and 14.4' in Telephoto mode. In Macro mode, its range is between 1' and 9.8' in Wide and 1' and 5.9' in Telephoto. It includes many modes based on red-eye removal functions, including Auto, Forced Flash, and Slow Synchro. The camera has a .2" electronic viewfinder offering approximately 200000 dots and 99% coverage when shooting and 100% coverage in playback. It also has a 3" LCD at 230000 dots offering 97% coverage when shooting and 100% coverage in playback. The camera has an NTSC/PAL selectable video output and an HDMI mini connector, not offered by many similar models. It connects to computers and printers via USB 2.0 and takes AA sized batteries, available either as alkalines, Ni-MH, and lithium batteries, as well as a DC coupler with an AC power adapter. Shooting at ISO 3200 or 6400 downscales the camera's resolution to 3 Megapixels. Few accessories are available for the S2550. Fuji sells AC power adapters and DC couplers, as well as an HD player.